This entry was posted on February 8, 2019, 2:50 PM and is filed under Fire Truck photos. You can follow any responses to this entry through RSS 2.0. Both comments and pings are currently closed. John, e-ones in process site is way behind. The only current build on there is the new 6-8-7. They still have one of the old tower ladders from last year on the aerial list. Did the Aerial Towers and other apparatuses switch companies? If yes, when did it happen. Hi does anyone know who is in charge of designing new fire apparatus for the department and what their position is? Luke, go to the link I posted and there’s a 300+ page document with the specs of all three rig types. For whatever reason it only opens up the entire document if you view it on a non-mobile device. If you try to look at it on your phone, only the first page is visible. The ladder specs indicate a 500 lbs tipload and two rear axles, which would seem to rule out the Metro. I wonder if the CFD will go with the metro 100, or the HM 100/110. I heard something about the spec requiring a tandem axle aerial, but i’m not too sure. I’m also curious as to whether they have the side mount ladders like the pierces, or just compartments like the spartans. Engines will remain relatively the same however the cab will be XL’s about 10″ longer. Trucks sound like they will be soon. Does anyone know when they will start designing the new trucks? The Engines i’m assuming will stay the same spec, but i’m wondering more about the new aerials. I’m also wondering when production will start. I find it hilarious that the spec wasn’t updated to actually list a model of traffic clearing light that is being made instead of listing a model not made or its equivalent. The TV show engine was a rig acquired from Evanston FD. Federal doesn’t make that light anymore hopefully they will go back to the mars 888 which is still made right here in Chicago by Trilite actually right across from where fleet was at north and Throop. So the idea is to modernize, revitalize and streamline the fleet. In other words newest state of the art rigs with the same parts and repairs. In doing this the spare fleet will be in a much better position as well. There are rigs in the fleet that do not work well for our operations and are constantly in for repairs. The crimson trucks are a prime example, the Pierce fleet is not doing well either many rust and corrosion issues that create safety concerns (aerials and frames). So we went to stainless steel and aluminum bodies, aluminum aerials and all galvanized frames. They are replacing Tower 34. We were already told this. The only reason I can think of they would not want to replace tower 34 is because they did get into an accident in 2009. Are they actually not going to replace tower 34? If so, why isn’t it going to be replaced? They’re going to replace all the tower ladders except tower 34. They’re never ever getting a new apparatus again…lol. Taking into consideration all the tower ladders, they still have to replace plus the new tower 24, that will actually allow two of the 3 2016 tower ladders to be replaced. My guess is 14 and 37. Where will the new Tower 24 be located at? I am guessing it will go to the new firehouse that is being built? Don’t forget Tower 54. This year I believe they are going to replace Towers 10 and 34. I think Chicago wants to replace towers 14, 37 and 39. Because there are 10 towers within Chicago, and eight when you take away towers 5 and 21 ( who both just got new rigs). So it makes sense they want eight new towers to replace the ones that haven’t been replaced yet, along with ones that aren’t that old. I am glad the city found a way to get rid of the 30 plus year old towers. With the delivery of tower ladders 5 and 21 has the city been able to scrap all the E-Ones from the 1980’s? With this order, the city will be able to get rid of the 1996’s as well. 580708	$2,026,028.00	11/30/2017	JOINT PROCUREMENT OFF HOUSTON-GALVESTON AREA COUNCIL CONTRACT #FS-12-15 HA09 WITH FIRE SERVICE, INC. PER SECTION 2-92-600 OF THE CHICAGO MUNICIPAL CODE FOR TWO (2) 100 FOOT LADDER TRUCKS AND RELATED EQUIPMENT / SERVICES. Have these two rigs been delivered yet? My guess is they’re buying 8 so that they no longer have a reserve tower fleet that is 30+ years old and well past its appropriate service life. Having decent spares is a good thing. City might be trying to add extra towers to the fleet. Would make sense to do so. Why would Chicago need to buy 8 new towers? The only ones I know that should be replaced are towers 10, 23, 34, and 63 at O’hare. Along with the new tower 24. And would the new aerial tower 7 go under the tower or ladder category? Slightly off topic boys but i have a question. I watched Chicago Fire the other day and Engine 51 is now a Pierce Arrow with grill bolted on the front with the Luverne emblem on it. My questions is does anyone know who’s Pierce it used to be? Contract is from 1/2019 to 1/2024. If it’s an even number of rigs annually, it’s 15 engines, 8-9 trucks, and 1-2 towers per year. By the end of the contract it might be the first time in CFD history that all the rigs of each type are identical. Over how many years is the contract? I am guessing they are going to be getting 8 engines a year? I am guessing this is like the Crimson Contract which was what over 10 years for those engines? Another contract was awarded to Crimson for aerial ladders from 2010 to 2012 ish. E-Ones should hold up well since Chicago beats the crap out of their rigs. The contract number is 86341. Click on the contract number link for a .pdf with specific details regarding the awarded bid for the near-total CFD fleet replacement. By 2024 there should be no front line engine, truck, or tower more than 7 or 8 years old. 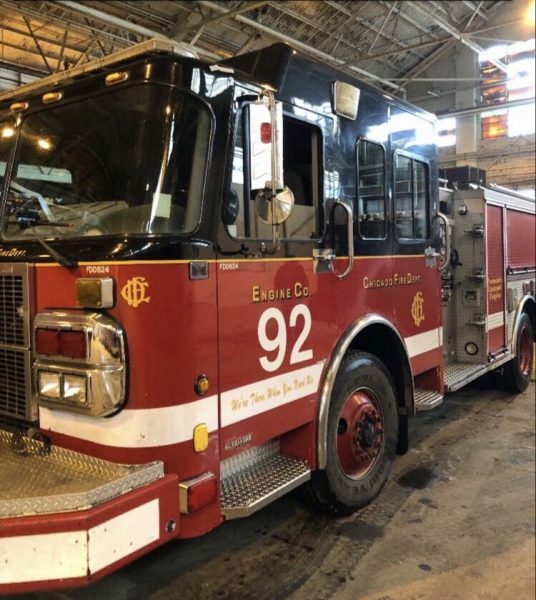 In other apparatus news, the city’s bid results website (which is down right now) showed that the $100+ million apparatus contract was finally awarded to Fire Service, Inc. 90 engines, 50 trucks, and 8 tower ladders from E-One. Since the 2000 Freightliner/American LaFrance engine blew its pump, They are getting this 2004 Spartan/Crimson Engine after using it for some time now. The only thing is that it was the only one of its kind. Say goodbye to the beverage truck! Whose rig did they get? Oh that’s sad, the unicorn is gone….